Below we highlight the performance of the S&P 500 during options expiration weeks since the start of 2006. 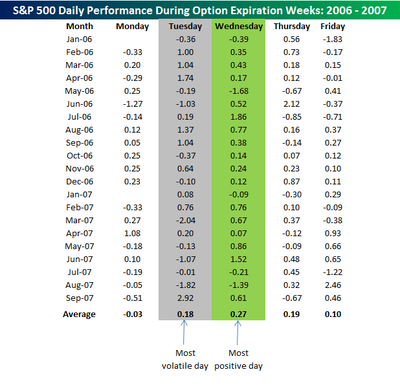 As the table below highlights, Mondays are typically the worst day of the week with an average decline of 0.03%. The most volatile day of options expiration weeks is Tuesday, as the S&P 500 has had a 1% move (up or down) on 10 of the last 21 days. The most positive day of options expiration weeks is Wednesday, with an average gain of 0.27% and gains 16 out of 21 times. Thanks for this info. Your daily performance calculation is based on previous day close to current day close? Yes. The daily percent changes are based on the prior day's close to the current close.